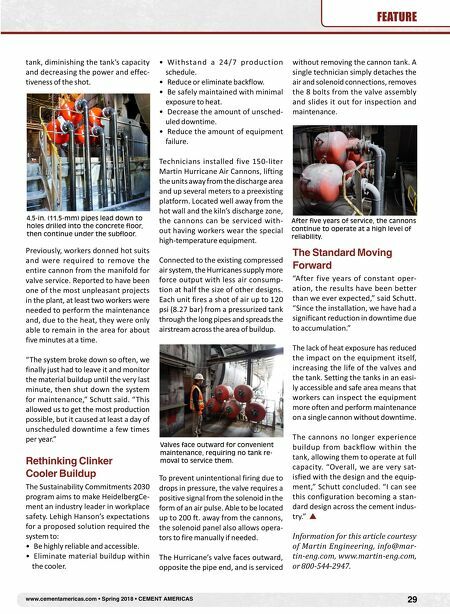 28 CEMENT AMERICAS • Spring 2018 • www.cementamericas.com FEATURE A U.S. cement plant needed to resolve clog ging issues in its clinker cooler, so it turned to using advanced air cannon technology and an innovative mounting strategy. HeidelbergCement's Lehigh Hanson facility upgraded to modern air can- nons and set them in a long U-shaped pipe configuration away from the hottest area of the cooler to offer powerful material flow support with easy maintenance. The result is a saf- er workplace, extended equipment life, less downtime and a lower cost of operation. Where clinker discharges from the kiln and falls into the clinker cooler, chunky material tended to cling to the stat- ic cooler grates and/or cooler curbs. Air cannons are commonly used to remedy this phenomenon, but if they experience clogging from backflow or if they are set in an environment that is too hot to properly maintain them, then accumulations inevitably form. Operators at the Lehigh Hanson plant in Leeds, Ala. – the oldest continuous- ly operating cement manufacturer in the state – worked closely with Mar- tin Engineering on an innovative air cannon configuration to resolve such an issue. "Our cannons were located close to cooler walls where the con- ditions were very hot and dusty," said Mike Schutt, production manager for Lehigh Hanson. Accumulation With a 24-hour production sched- ule, 175 tph of raw material is passed through the kiln, reaching approxi- mately 3,500 F. Accumulations formed at the discharge point, reaching up to 20 ft. tall in as little as a single shift. The buildup could stretch back into the kiln and cause serious problems that result in excessive downtime and an increased cost of operation. Lehigh Hanson's initial solution had five cannons with standard OEM pip- ing leading directly to problem areas located near the hottest part of the cooler. The area had an average sus- tained temperature of 150 to 165 F, which made maintenance during operation extremely difficult. Over time, fine particulates from dis- charged clinker would migrate up the air cannon discharge pipe. 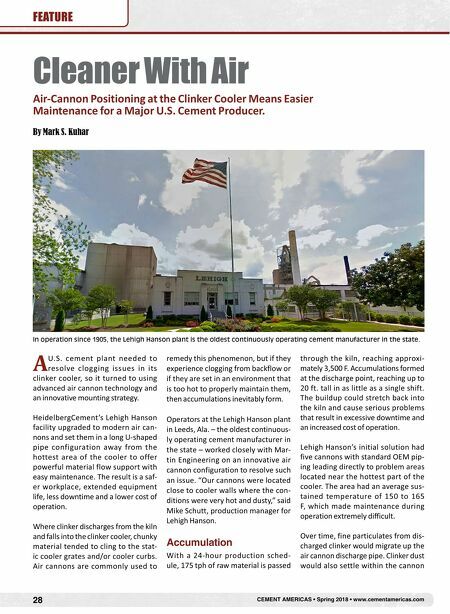 Clinker dust would also settle within the cannon Cleaner With Air Air-Cannon Positioning at the Clinker Cooler Means Easier Maintenance for a Major U.S. Cement Producer. By Mark S. Kuhar In operation since 1905, the Lehigh Hanson plant is the oldest continuously operating cement manufacturer in the state.